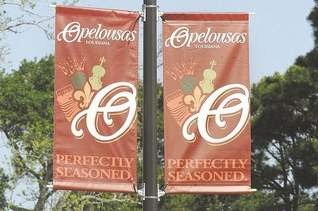 Opelousas' new branding campaign — "perfectly seasoned" — became a reality this week with the first street banners going up at city's tourism center. "This is just a small part of our branding development campaign," Tourism Director Melanie Lee said of the half-dozen large banners now on display at Le Vieux Village on U.S. Route 190. "This is a way to introduce our new logo and branding promotion to the people," Lee said of the banners, which feature a stylized "O" for Opelousas, accented with an accordion, a fleu-de-lis, a spice shaker and a fiddle. Lee said the accents were chosen to highlight the city's culture, history, food and music — all set off with the slogan "perfectly seasoned." "They are attractive and certainly eye-catching," Lee said. She said these first banners, paid for by the city's Main Street Committee, are designed to make it easier for tourists to identify parking around the village, which serves as the city's tourism center. Lee has applied for a $200,000 grant from Preserve America to greatly expand the program throughout the city. "It will hopefully get us the funds we need to provide the planning and implementation of way-finding signage to point out our cultural and historic assets throughout the city," Lee said. The program is all part of a image campaign developed for the city by Arnett & Muldrow, a community branding company. In a series of community meetings earlier this year, the "perfectly seasoned" tagline especially got rave reviews. "This is exceptional. That tagline is not trendy but very progressive. It can be applied to everything from perfectly seasoned education to perfectly seasoned food," said Opelousas City Court Administrator LaVonya Malveaux, who attended those meetings. Ben Muldrow said the slogan is designed to work on multiple levels, with perfectly seasoned standing for everything from the area's 300-year history to its blending of cultures. "The very way you live life here is a blending," Muldrow said. Tripp Muldrow said a major objective of any branding initiative is to build community pride around an agreed upon set of images and phrases and then use those to project that pride to potential investors, visitors and businesses. "A city must have a unified, professional image if it wants to build local businesses and attract others," Tripp Muldrow said. To help spread the logo and slogan the brothers, who were paid through a Certified Local Government Grant, have prepared a free 12-page style guide. "It tells you how to use these elements. It also tells you what not to do," Tripp Muldrow said. The hope is that not only the city, but other groups, festivals and merchants will join in the promotion effort. The brothers have also incorporated the information and designs into a DVD that the city can supply to printers, festival promoters and others. For copies of the style guide or DVD, contact the Opelousas Tourism office at 948-5227. Ben Muldrow, a Partner at Arnett Muldrow & Associates, is responsible for all community marketing and branding functions of the Greenville, SC-based urban planning firm. Ben helps communities to develop their brand identity through an open process including public design sessions and collaborative small groups. He has designed new branding and marketing elements for revitalization projects in over 175 communities in South Carolina, North Carolina, Virginia, Georgia, Illinois, Wisconsin, Vermont, Michigan, Ohio, Kentucky, Arkansas, Louisiana, Minnesota, Iowa, Maryland, Missouri, Delaware and Mississippi. Where Are You Putting YOUR Effort? Congrats to the Great American Main Streets!